The Wilden Pump is available in various sizes ranging from 6 mm (?) 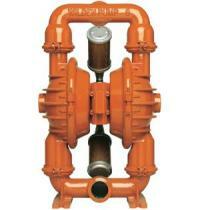 to 203 mm (8") allowing for optimum flow rates. A wide variety of construction options are available to meet virtually any application requirement. The Wilden pump can handle pressures up to 221bar (3,200 psig) and temperatures to 176.7?C (350?F). Liquid path materials of construction include: aluminum, cast iron, stainless steel, alloy C, polyethylene, polypropylene, PVDF, carbon-filled (acetal, polyethylene, Teflon? PTFE) Teflon?PFA, and PTFE. Wilden抯 line of pump accessories enhance and protect your liquid process as well as add value to it. Whether you need a surge dampener to minimize pressure fluctuation, or an electronic controller to automate your pumping process, these accessories allow your Wilden pump to maximize your pumping process.